Anyone been on the Maharajah Jungle Trek recently will see some major work being done to one of the exhibits. Its the old tapir exhibit which is in between the Komodo and the bats. For years (since the tapir passed away), it has housed some Asiatic ducks and Sarus cranes, which have been moved back to the large exhibit of blackbuck, Eld's deer, and water buffalo. As you can see, this is major work. This is tarp currently covering the glass which will surround the exhibit. What does that mean? Typically, it means something that can easily get out. Like perhaps a species of primate. 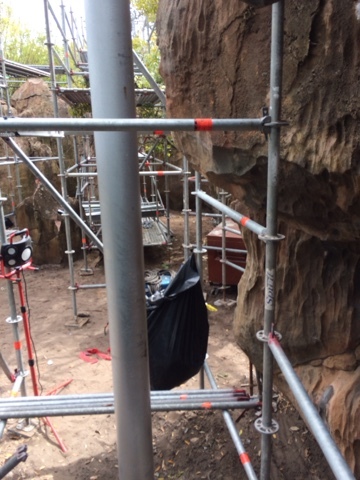 Also, they are obviously working on the rockwork with this scaffolding. Will they be adding trees and other arboreal structures for an animal such as a monkey, or even something like an orangutan? Maybe. Another possibility is a predator of some type, like a leopard. But we should be getting an announcement soon.